P-51D-20NA tracteur de cibles / Contre mesures Electroniques non historique de la Force Aérienne Suisse. 8 skins du STAFFEL 24. Livrée inspirée par les Pilatus PC-9 suisses. C-401 / C-402 / C-403 / C-404 / C-417 / C-418 / C-439 / C-444. Template de JAVA Serval. Internals de Goodwood / Sebtje. Non-historical P-51D-20NA operated by the Swiss Air Force as a target towing aircraft and electronic counter measures aircraft. 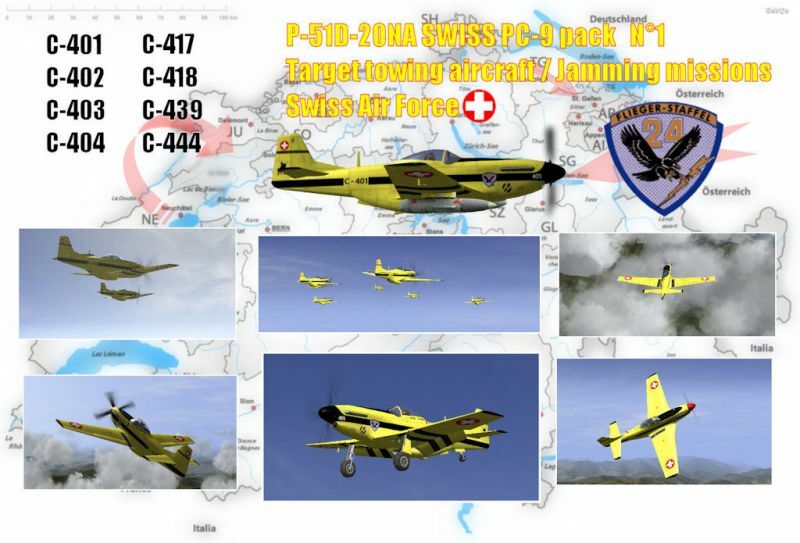 8 skins from the STAFFEL 24 with camo inspired by the Swiss Air Force Pilatus PC-9. C-401 / C-402 / C-403 / C-404 / C-417 / C-418 / C-439 / C-444. Template by JAVA Serval. Internals by Goodwood & Sebtje.